that ... 72% of consumers shop at stores within 10 miles of their home. that ... 81% of shoppers conduct online searches before making big purchases. that ... 72% of adult internet users use Facebook. 35% of those users are 65 and older. that ...90% of all socially active businesses have indicated that their social media efforts have generated more exposure for their business. that ... research has shown when people hear information, they are likely to remember only 10% of that information three days later. However, if a relevant image is paired with that same information in a visual, people retained 65% of the information three days later. that ... 66% of Americans own at least two digital devices -- smartphone, desktop or laptop computer, or tablet -- and 36% own all three. that ... 29% of people want to talk to a salesperson to learn more about a product. So what does all of this have to do with Grange? Everything. Each one of the statements above can directly apply to your Grange. Granges operate as if they are businesses, and as such, many of the same statistical statements apply. Let’s substitute Grange terms instead of business terms to the ‘Did You Knows’ above. It’s eye opening. that ... 72% of Grange members look for Grange meetings within 10 miles of their home. that ... 81% of Grange members conduct online searches before joining the organization. that ... 72% of adult internet users (who are Grange members) use Facebook. 35% of those users are 65 and older. that ... 90% of all socially active Granges have indicated that their social media efforts have generated more exposure for their organization. that ... research has shown when Grange members hear information, they are likely to remember only 10% of that information three days later. However, if a relevant image is paired with that same information in a visual, Grange members retained 65% of the information three days later. that ... 66% of Grange members own at least two digital devices -- smartphone, desktop or laptop computer, or tablet -- and 36% own all three. that ...29% of prospective Grange members want to talk to an active Grange member to learn more about the organization. If you or your Grange needs assistance in marketing, social media, publicity and more, please contact the Public Relations Committee. We’re here to help! 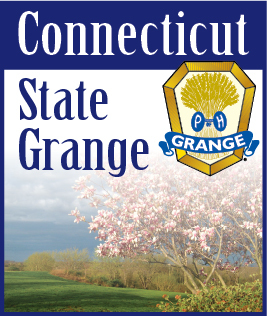 E-mail: publicrelations@ctstategrange.org or information@ctstategrange.org .